When I started paleo, I was pretty devastated that pizza was out of the question. 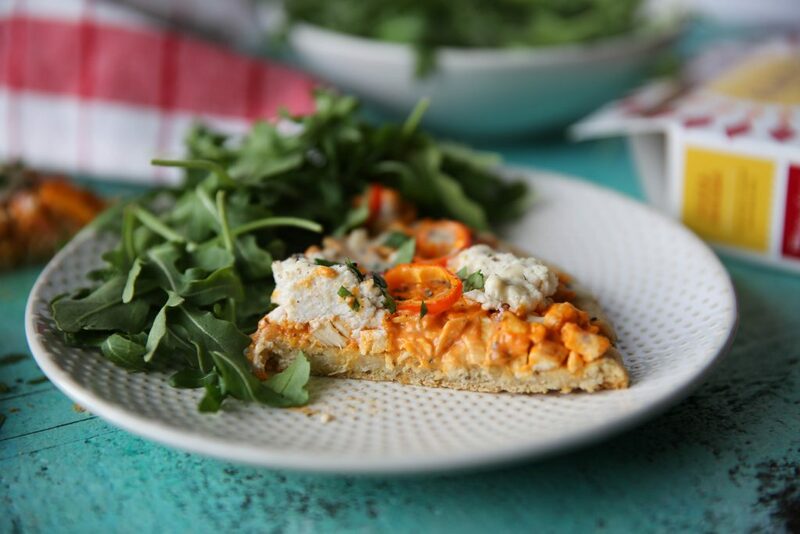 And I’d have to make crappy cauliflower pizza any time I had a Friday night craving…which was never the same. But that was 7 years ago and luckily pizza has come a looooong way since then. And thanks to Whole Foods, I’m constantly finding new brands and new companies that are making paleo easier and more delicious than ever! Brands like Simple Mills, Primal Kitchen, Kite Hill, Bonafide Provisions, Siete Foods, Epic Provisions and so many others are making the paleo lifestyle incredibly easy. 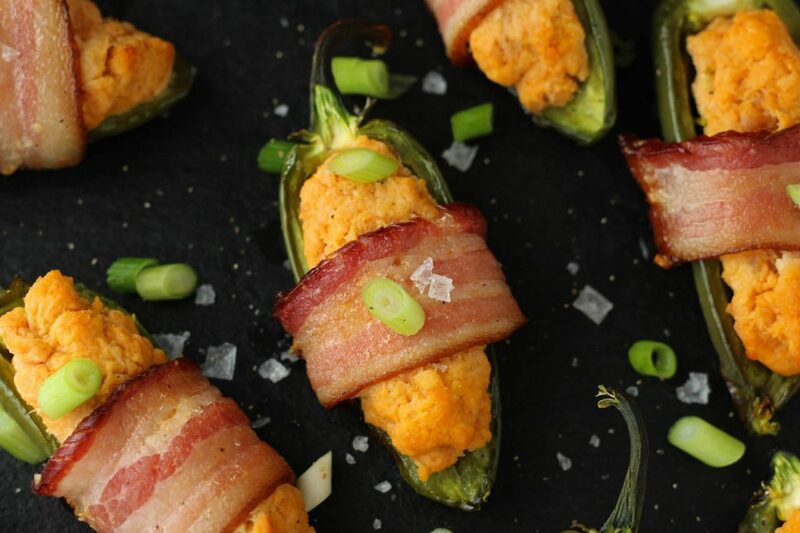 Even Nom Nom Paleo recently teamed up with Whole Foods to bring her amazing recipes to their hot bar! You can literally walk into a Whole Foods now and quickly get paleo to go! It’s so freaking awesome! 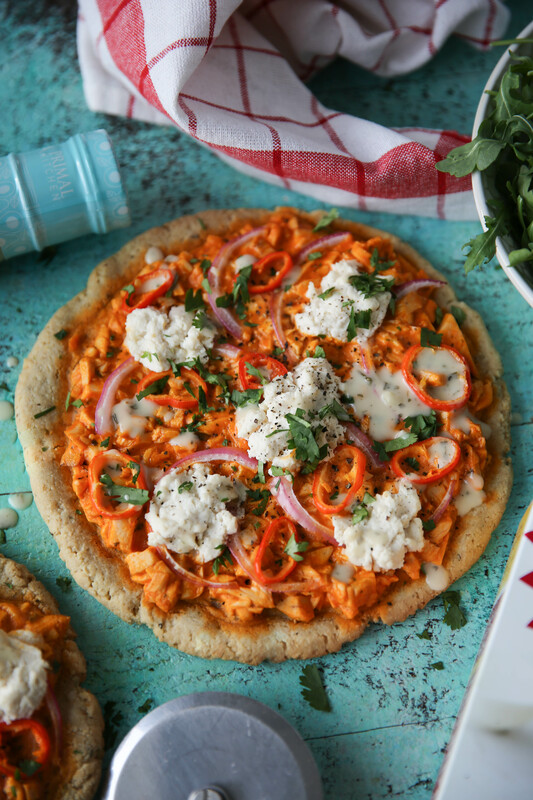 So today I’m teaming up with Whole Foods to share some of my favorite paleo and gluten-free brands that I used to whip up this gluten-free, grain-free and dairy-free pizza that doesn’t make you feel like you’re limiting yourself or changing your diet. When I started paleo, it was before it became so popular and mainstream and I constantly felt like I couldn’t stick with it because I craved pizza and cookies and all kinds of other things I ate before paleo. But nowadays, it’s easier than ever to make the step into paleo and begin to make better and better choices when it comes to your diet. And Whole Foods is stepping into the future and making it so easy for you, too! Whole Foods is where I shop the most. It’s where I get my fish and seafood, my favorite paleo products, and now it will be the place I go for lunch to get Nom Nom Paleo meals at the hot bar. No more worrying out canola oil or wheat or dairy in my hot bar meals. Instead I’ll be eating paleo recipes that I’m proud to put in my body! We are living in such a cool time that companies are changing and evolving as we have more knowledge about food and how it effects our body, and Whole Foods is at the forefront of that evolution! So excited to see what the future holds when it comes to clean foods and better choices! Follow instructions on the Simple Mills Pizza Dough box to make two 8" pizzas. Once dough has been pre-baked, mix together minced chicken, 1/2 cup ranch, 1/4 cup hot sauce and salt and pepper. Then whisk together 2 tablespoons ranch and 2 tablespoons hot sauce in a separate bowl. With the small amount of ranch and hot sauce whisked together, sauce each pizza, leaving a little edge of the crust. Then evenly spread the chicken mixture on top of each pizza. Lastly, top each pizza with sliced red onion, peppers and then top pizza with a few dollops of the ricotta cheese throughout. Top pizza with cilantro and a little extra Primal Kitchen Ranch on top! This post is brought to you by Whole Foods! I may be compensated for this post and through my affiliate links in this post, but all opinions are my own. This compensation helps with expenses to keep this blog up and running! Oh my goodness this sounds so yummy!! For me high school lunches consisted of French fries smothered in Franks Red Hot and ranch dressing. Of course the fries were probably fried in gross oil (heck, who knows if they were even real potatoes!!) and the ranch was full of yucky ingredients so now I’m making my own fries and using Primal Kitchen Ranch cause it’s the best. 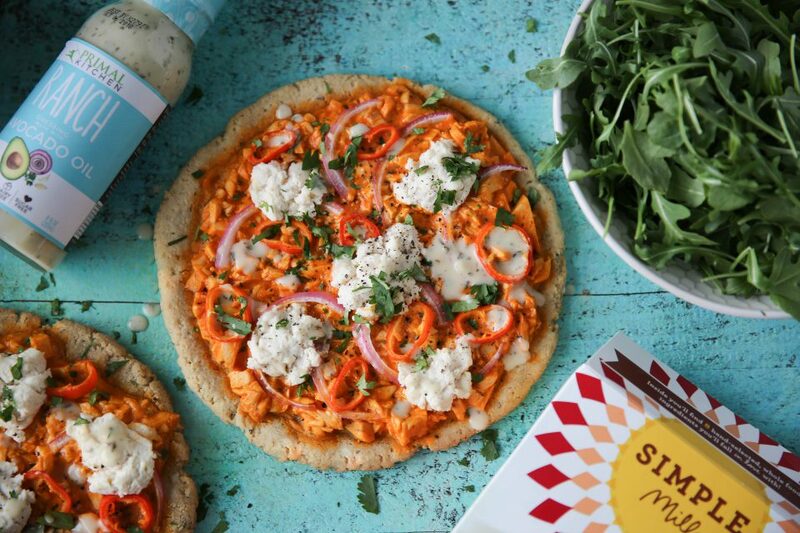 I’ve been meaning to go to Whole Foods soon to stock up on a few items and you just gave me a reason to get over there asap so that I can make this pizza!!! How does the Simple Mills crust compare to the one in your cookbook, taste and texture wise? We love the cookbook version. Which cookbook is your pizza crust in? I can’t do almond flour (or garlic or eggs) so would love another option. I have done Trader Joe’s califlower pizza crust but it has corn in it so not Paleo. I don’t really care that much about being 100% paleo just about eating things that don’t make my body hate me. The califlower pizza crust is OK if you put a lot of stuff on top but something more pizza like would be awesome. the recipe is in my third cookbook 0 Juli Bauer’s Paleo Cookbook! what timing! 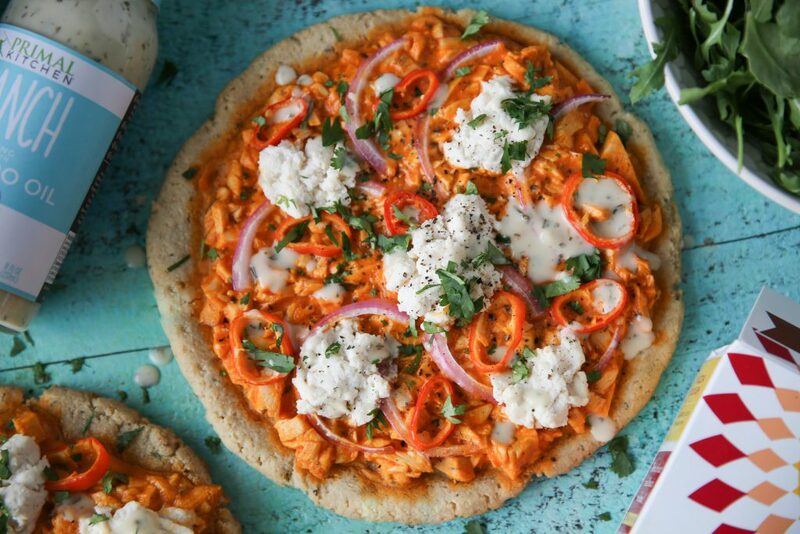 I was actually going to make buffalo chicken pizza on simple mills dough tonight. Question though: Can i make 1 large pizza crust instead of 2 personal ones? Me and this pizza are soooo having Friday night. We’ve started making home made pizzas on the weekends so will definitely give this base a try! So cool that Nom Nom has teamed with Whole Foods to bring some more paleo food to the hot bar and I’ll be sure to keep a look out for it. There aren’t many options if you want to avoid canola oil. I actually e-mailed Whole Foods customer service last year and asked whether they would consider using cleaner cooking oils. They replied and said there was no evidence to say canola oil was bad for you…hmmm. well nom nom’s meals are completely canola oil free so you won’t have to worry about that anymore! What kind of oil do you use to mix up the crust? Do you use grapeseed oil like the box suggests? 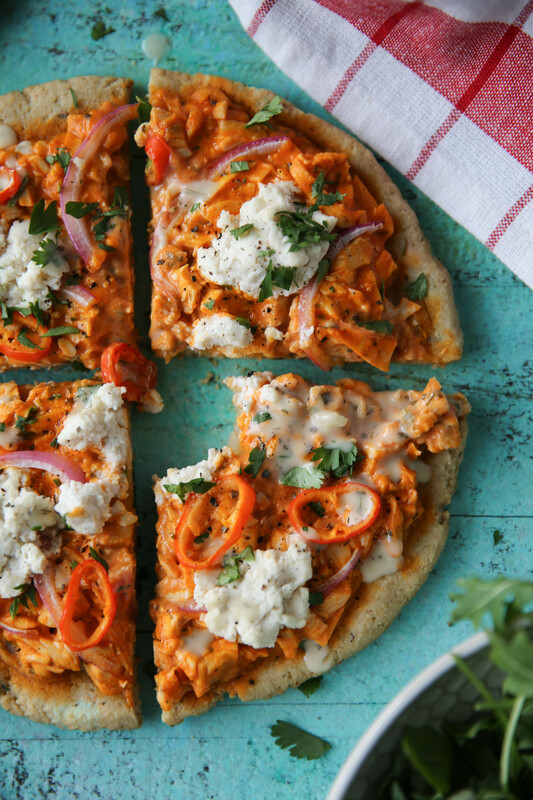 really anything buffalo chicken is football worthy! it is dairy free. the brand of cheese is almond milk cheese. be sure to check out brands i mention! i wouldn’t lie to you. Do you have any recommendations for ranch dressings that aren’t made with avocado oil? I’m super allergic to avocado (worst allergy EVER) and have had a super hard time finding a good, clean ranch dressing that’s not homemade. That pizza looks AMAZING- can’t wait to make it! Nom Nom Paleo has an excellent one in her first cookbook. Just make your base mayo with extra light olive oil – Mel Joulwan’s from her Well Fed cookbook is the easiest! Believe both are free on their respective websites. Just recently found your website and I’m in love! We eat a paleo-based diet with the occasional serving of quinoa or rice. Love all of these ideas! I’m thinking about getting your cookbook but I have one question. Do your recipes in your cookbook include nutritional facts? I know I can go plug them into MyFitnessPal but I HATE doing that. Just let me know! Thanks! yayyyyy!! that’s awesome!! so glad you both loved it! This looks amazing! I’m wanting to make it tonight and noticed in the recipe you instruct to put the assembled pizza into the oven for 15 minutes. However, I’m not seeing what temperature the oven should be at. Is it the same temp you cook the simple mills crust at? Juli, this recipe was absolutely wonderful and we have already made it twice! 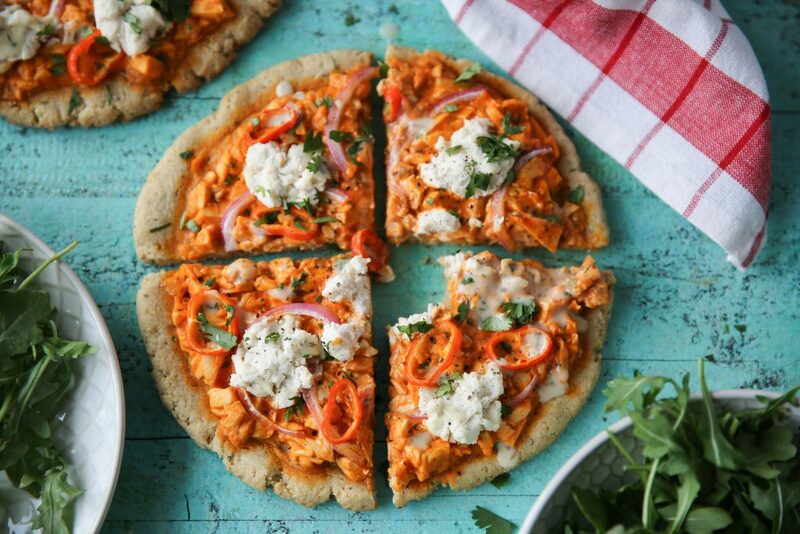 I substituted Cauli Power brand crust that I had in the freezer because we were on a time crunch and this buffalo chicken pizza has been the ONLY way that I am able to get my husband to eat cauli. Thank you for always sharing such wonderful recipes, keeping me inspired, and being flat out honest and funny and real on your Insta. You’re the best!! thank you so much for leaving a comment! i’ve never tried that pizza crust! adding it to my list! thank you for the kind words and thanks for trying out my recipes! Just made this for valentines dinner and DAMN its delicious!! Why are all of your recipes so amazing?! This was delicious! I will definitely make it again. And my husband, who is a reluctant participant in the paleo world, loved it too. 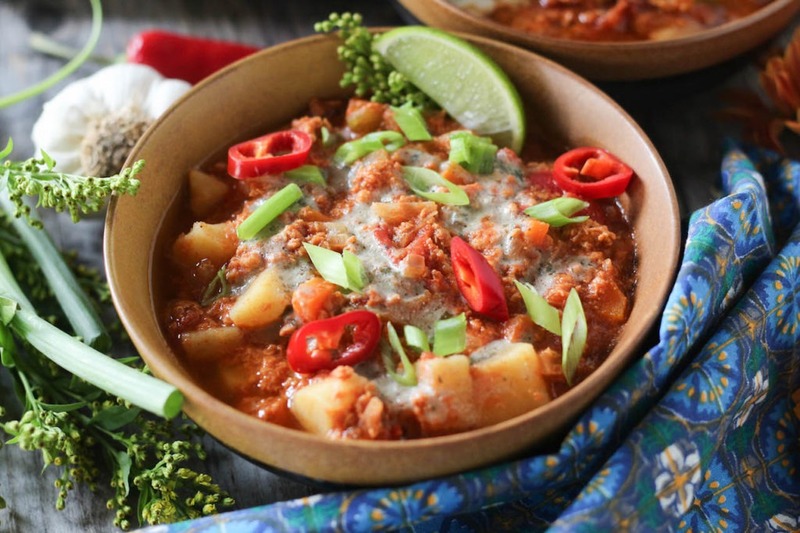 Thanks for continuing to post creative and yummy recipes!